So excited my week to pick has finally rolled around! 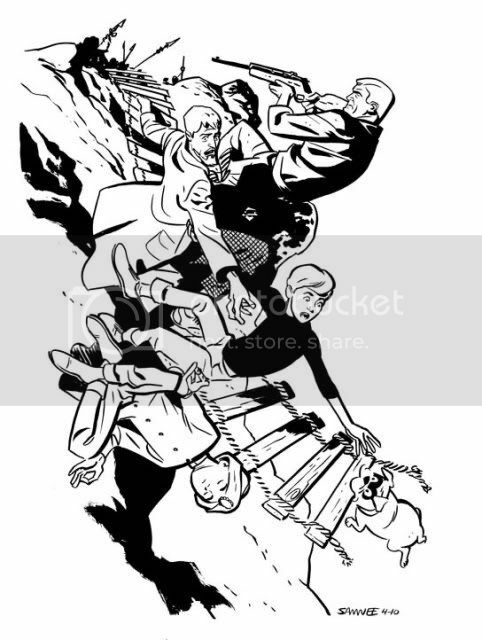 Jonny Quest has been my favorite cartoon since I was a kid. It's really a perfect show! This was all done in brush to change things up a bit. I rarely work solely in brush anymore because it takes longer, but I couldn't resist taking a little extra time on my pal Jonny! Hope you enjoy! Jeez, that's perfect, Chris. The centerpiece to this for me is Hadji though. That's brilliant. But I have to ask, please clarify what you mean by it taking longer when you work in brush? Is it the effort of keeping a good point on the brush or the dipping? Are you using a brush pen instead these days? Enquiring minds (mainly me) would like to know. I've always been a brush man when it comes to inking. I love slopping down blacks. To me, that's the quickest and most spontaneous way to ink instead of getting mired in noodling with pen and such. So to hear this from an artist whose primarily spotted blacks more than piqued my interest. Nailed it! Loving that perspective. Almost looks two-point. Absolutely brilliant idea for an image. And great rendering: do more brush-work - real slick! Awesome action shot! Nice work! Nice spotting of your blacks. I love the motion. You nailed Race with his shoot first ask questions last attitude. Plus Hadji and Bandit are perfect. It took me a bit to notice bandit but he's like a fun little easter egg hidden in the back. Chris wins Johnny Week, hands down. Oh my God, Chris - this is absolutely sensational. You were BORN to draw this strip! Jeez--this is phenomenal--top to bottom. From the composition, to the spotting of blacks, to the fantastic linework. A classic piece for a classic cartoon. Awesome!! I actually just told Chuck BB to do a drawing of Jonny. What a weird coincidence! This piece is so amazing, Chris. Everything about it just blows me away, but if I had to pick one thing it's gotta be the composition. How you fit so much into a drawing without letting it get cluttered or confusing. Gah, just sensational. My favorite of yours so far!! Fantastic on every level!!! Adrian Johnson: I use brush on everything I do nowadays but, as for taking my time and doing this entire piece in brush, I generally do most of my fine line work really quickly with a felt tip marker (Faber Castell Pitt pen size M) before a brush ever hits the page. really killer, man. georgeous lush brushy inks, fluid action, just really nice all around. i can only imagine that even Toth himself would be proud. this is just awesome, Chris. Great composition, lot of energy. A bigger scan of this is sorely needed.